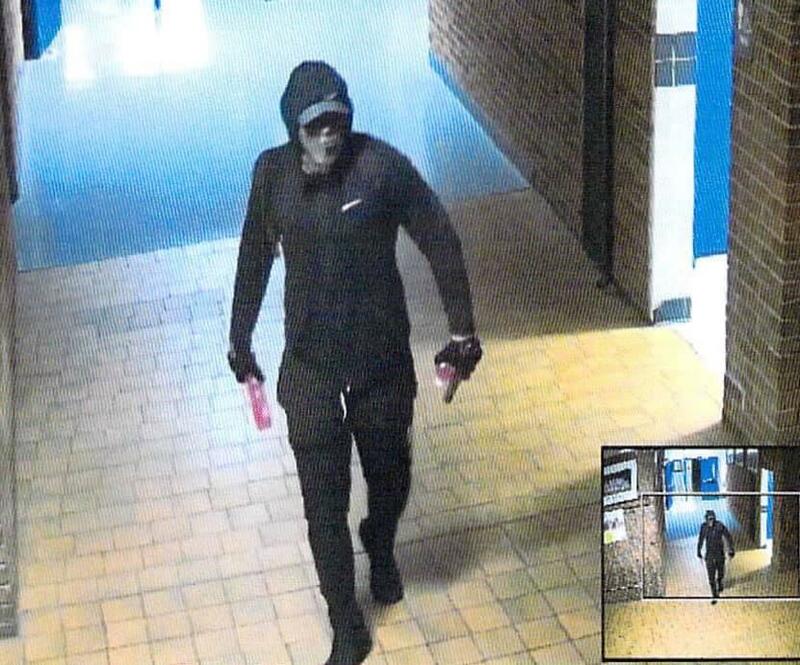 The Daviess County Sheriff's Department released this surveillance photo of the person who broke into Apollo High School. Police in Owensboro are investigating a burglary that occurred at a local school. Apollo High School canceled classes on Thursday to allow a thorough search of the building and to investigate the scene. According to the Daviess County Sheriff’s Office, the vice principal went to open the school just after 6:00 a.m. when he saw someone run from the building dressed in all black and wearing a mask. As of late Thursday afternoon, law enforcement was still searching for the suspect. In a news conference, Daviess County Schools Superintendent Matt Robbins said the burglary was an isolated incident. The sheriff’s office says the burglar broke out a window and was able to reach inside and unlock a door. There was no other vandalism and police say the only thing taken were two bottles of water. Extracurricular activities this afternoon and evening are still on as scheduled and students will return to the classroom on Friday. Daviess County, Kentucky now has a 211 help line that can connect area residents to a wide range of services. The most important feature of the new 211 help line is that it has a person on duty 24/7. That person helps the caller determine the best agency or organization to meet their needs and assists them in getting connected. The 211 service is provided by United Way of Ohio Valley. Owensboro Community Development Director Abby Shelton said the resources in the 211 database cover a huge range of topics. "It can give you information on crisis hotlines, housing assistance, utility assistance, foods and meals, health care, health screening, addiction and substance use, mental health behavior, dental or vision, parenting and child care, on and on and on…,” said Shelton. Former Kentucky Republican State Representative DJ Johnson has withdrawn his challenge for the 13th district state house seat in Owensboro, conceding to Democrat Jim Glenn. The race was decided on Election Day by a single vote. Johnson previously asked lawmakers to pick a winner by drawing names or flipping a coin. The former representative told the Messenger Inquirer he hasn’t ruled out running again in 2020. Johnson said holding a special election would be a distraction for Daviess County. The chairman of the Daviess County Public Schools Board of Education, who began working in Kentucky schools more than 50 years ago, has resigned. Mike Clark began his education career in Michigan. He started teaching in Kentucky in 1963 as a chemistry teacher at Apollo High School in Daviess County. He’s also been principal at Burns Middle School and Daviess County Middle School. Clark retired from Daviess County Public Schools in 2000 and went on to be a principal in the Owensboro Catholic schools system. He’s been a member of the Daviess County Public Schools Board of Education since 2011, and been chairman for two years. He told the board his resignation is because he is moving out of District 1, which he was elected to represent. The Daviess County Animal Shelter has declared a “code red.” That means the shelter is stepping up efforts to reduce the number of animals so it doesn’t have to euthanize healthy, adoptable pets. There are currently 69 dogs, 83 cats and four rabbits. Shelter Director Ashley Clark says there are several ways to avoid unnecessary euthanization. The Daviess County Board of Education has approved a controversial nickel tax to fund school construction and renovation. The nickel tax is the equivalent of 5.7 cents per $100 of assessed property value. By law, the school system can use the revenue only for facilities. Assistant Superintendent Matt Robbins says the tax will pay to renovate Apollo High School and replace the 85-year-old Daviess County Middle School. "Daviess County Middle School is categorized as a category five facility, which means it's in the worst condition of those in the state," Robbins told WKU Public Radio. "Apollo is just the next rung on the ladder as a category four facility. The rest of our facilities are either in a three, two, or one category, which puts it into perspective." Forty young refugees in Owensboro will get jobs this summer thanks to a workforce training grant. The $45,000 grant is from the group Catholic Charities and is being administered through its Kentucky Office of Refugees. The Daviess County Board of Education has named its new superintendent for public schools. He is Matt Robbins, the school district's current assistant superintendent for finance and operations. He began working in the school district in 1997. Robbins has a master's degree in education administration from the University of Louisville and a bachelor's degree from the University of Kentucky. He will replace current superintendent Owens Saylor, who will retire at the end of June. The Board of Education made the announcement at a special meeting March 20. Robbins was one of three finalists for the position. The board also considered Casey Allen, superintendent of Ballard County Public Schools, and Jason Hamby, superintendent of Trigg County Public Schools.